Acting White House chief of staff Mick Mulvaney said Sunday that whether the Trump campaign's actions regarding Russia were unethical is not important; what matters is that those actions were not found to be criminal. Mulvaney was asked by CNN's Jake Tapper on "State of the Union" to respond to House Intelligence Chairman Adam Schiff's statement last week that the campaign acted immorally and corruptly with regard to Russia, whether it involved Trump's negotiations over a possible Trump Tower in Russia, former campaign chairman Paul Manafort's sharing of polling data with a Russian associate who law enforcement has said is linked to Russian intelligence,or the June 2016 Trump Tower meeting between top campaign officials and Russians who promised dirt on 2016 presidential nominee Hillary Clinton. "The issue is not whether it's ethical," Mulvaney said before criticizing the California Democrat's handling of his chairmanship. "But, forgetting Adam Schiff for a second, what about the larger point about ethics and morality?" Tapper said. "I think the voters are going to decide about the ethics and morality of the people they vote for on either side," Mulvaney responded. "People liked Bill Clinton even though they might not have thought he was that ethical. That's not the job of the House Intelligence Committee. It's not the job of the House Judiciary Committee. It's not the job of the House Oversight Committee. They're supposed to review the functioning of government. Voters make decisions about the candidates in other places." Last week, Attorney General William Barr released a four-page summary of Mueller's several-hundred-page report on his nearly two-year investigation into Russian interference in the 2016 presidential election and whether the Trump campaign colluded with Russian officials. Barr said Mueller found that the campaign or anyone associated with it did not collude with Russia. On potential obstruction of justice, Mueller's report did not implicate nor exonerate the president, but Barr — who authored a memo criticizing Mueller's obstruction investigation before becoming attorney general — said he would not pursue obstruction charges against the president because he felt the evidence did not warrant them. On Friday, Barr said in a letter to leaders of the House and Senate Judiciary committees that he would release publicly Mueller's report with redactions within a couple of weeks. Barr said in that letter that there "are no plans to submit the report to the White House for a privilege review" before its public release. Trump has said he has "absolutely nothing to hide." But in a pair of Friday tweets, Trump seemed to suggest he might not want the full report released, saying that "no matter what the Radical Left Democrats get, no matter what we give them, it will never be enough." "Just watch, they will Harass & Complain & Resist (the theme of their movement)," he wrote. "So maybe we should just take our victory and say NO, we've got a Country to run!" Asked about those comments, Mulvaney said the president was not suggesting the full report should be withheld. 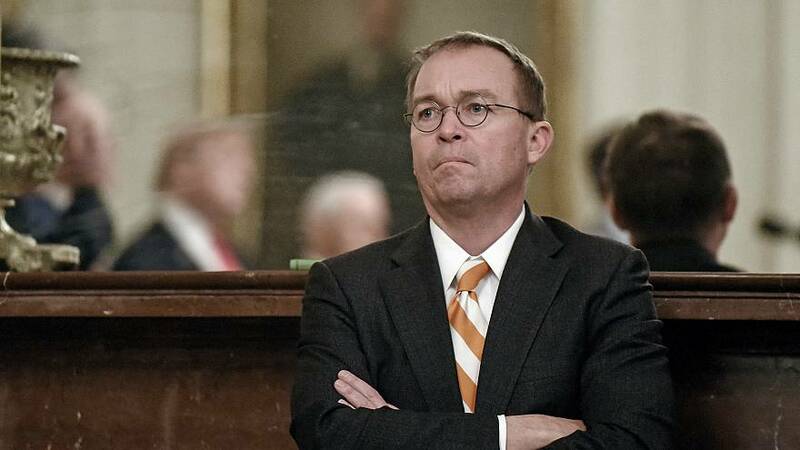 "I think the president is just venting the same frustration a lot of people had when the Mueller report came out, and it turned out exactly like he said that it would," Mulvaney said. "So, now, as usual, you take the president at his word in his tweets. … But it's done now. The report is there. It's extraordinarily thorough, as you know. I think they talked to 500 people, issued 2,800 subpoenas. And it completely exonerates the president. There's no collusion. There's no obstruction of justice." In his report, however, the special counsel said that "while this report does not conclude that the President committed a crime, it also does not exonerate him," Barr wrote in his summary. An NBC News/Wall Street Journal poll released Sunday found that Americans don't see a clear verdict on whether Trump has been cleared of wrongdoing. The poll, conducted in the days immediately following Barr's summary, found that 29 percent of Americans say they believe Trump has been cleared of wrongdoing while 40 percent say they do not believe the president has been cleared. Nearly one third of Americans — 31 percent — are not sure if Trump is cleared.